Here's a nice ending to our week of 1910 Benjamin Gifford images promoting agriculture in the Hood River Valley. It looks like E. H. Shepard has won several awards with his apple display. I don't know if this is a local agricultural fair or a national one. Hood River apples (and now pears) have had a national presence since this era. Hood River orchardists shipped their fruit to all types of fairs, both state wide and national wide. Hard to tell whether this is a local type fair or a big one. 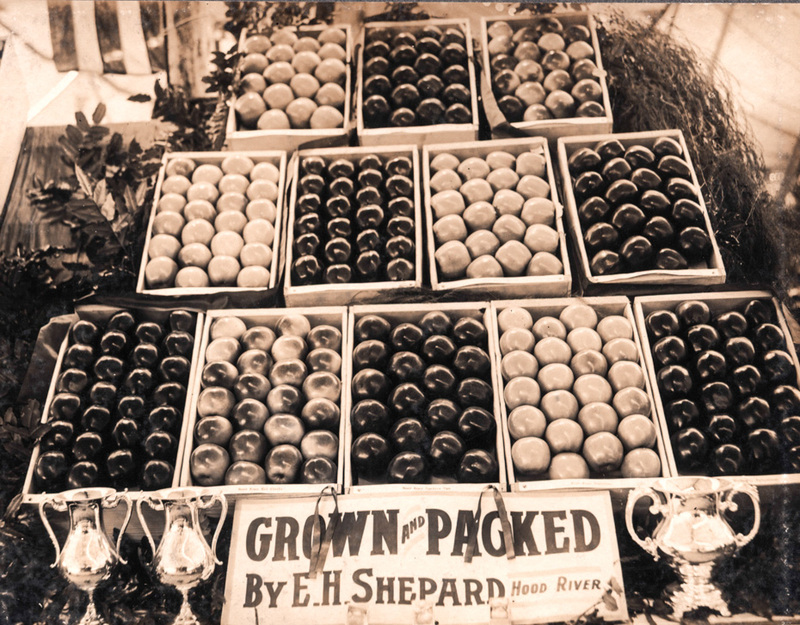 I know my own great-grandfather had fruit on display at the World's Fair in St. Louis. In fact he traveled to it, stopping in Illinois to visit family and one of his cousins decided to accompany him to the fair. I have articles and some items from that trip. When I was a kid, walking around the county or state fair, I always thought these displays were really boring. I have at least a dozen WF Layaway photos of this same apple show. Including a picture of what looks like this exact same display (although showing only a single prize cup) I will see about putting together all of the WF Laraway apple display pictures into a single collection and post them on my Facebook page and on Flicker so they can be accessed. I should add that I think that WFL supplied these prize cups, since, as I recall, I have a picture of the prize cups as a window display in the WF Laraway shop in Hood River. Which also means that it would have been WFL who supplied the cups and the engraving, most likely. And, I'm reasonably sure that this was in Hood River.